Did you know that today is National Macaron Day. For those of you who do not know what a Macaron is, Macaron is a scrumptious delicious bitesize dessert originally from France. Those sweet desserts are made with egg whites, icing sugar, granulated sugar and ground almond. 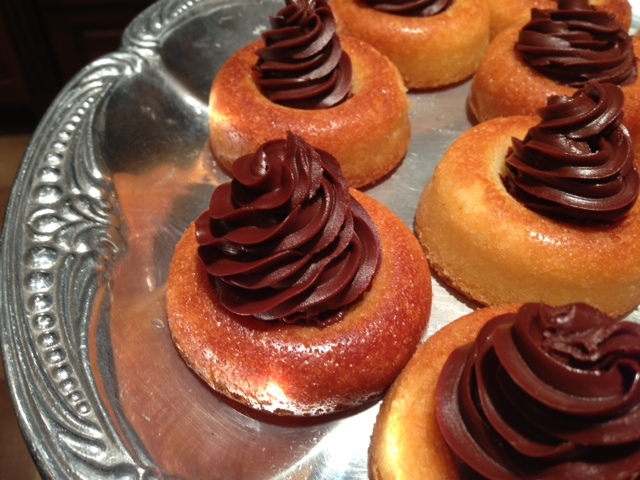 It is usually filled with buttercream, jam, or flavored ganache. It is hard to describe a macaron. People often want to compare them to meringues because they are light like meringues, and a bit fluffy like them also, but that would not give them justice!!! Macarons are like heaven in your mouth. Those cloud like cookies will take you by surprise. Because of their crunchy shell, you will not expect their smooth and soft, delicate filling inside that will melt in your mouth releasing their delicate flavors. A very re-known Chef by the name of François Payard once described his sensation when eating one:” the many different flavors textures and flavors will hit you all at once”. Have you had yours today??? If you have not, it is probably too late, though it depends where you live. But if you live in my corner of the world, you are probably out of luck. But, Easter is coming soon, so you can always order some for a special someone. They make for great gifts, and they are very impressive!!! And they will, always always please your crowd!!! Not really sure what to bring your mom, or grandmother for Easter. Don’t just settle for chocolate eggs, bought from the local grocery store. Get them something that has personality, get them something that is fabulous like those Parisian Macarons. They are yummy, delicious, you will not regret it. Plus they are gluten free. Let me know if you wish to order some. ( Minimum Order is a dozen per flavor). Please place your order 48 hours in advance as Macarons are best eaten fresh, and they will need to be made the day prior of the delivery. Thank you! ( Price upon request). Call to order at 864-494-4494. 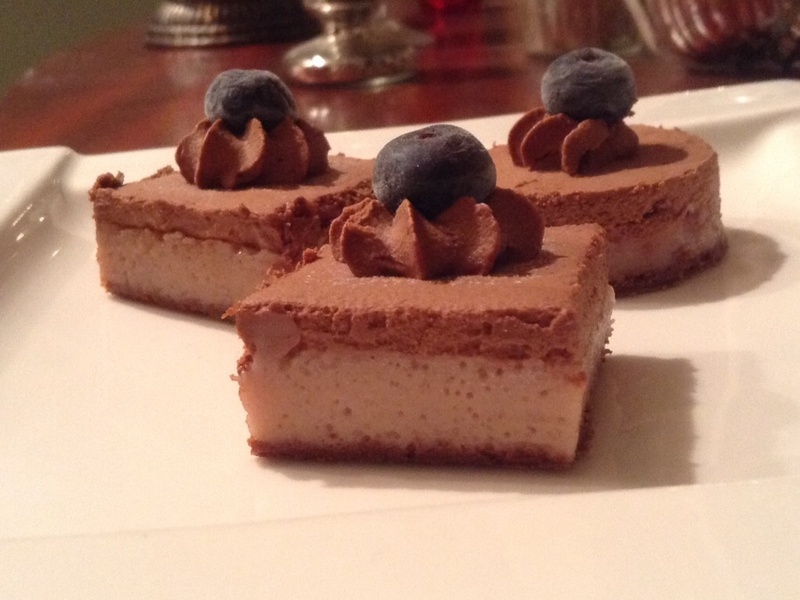 Last week was Mother’s day and as such, it called for a fabulous dessert. But what to do??? 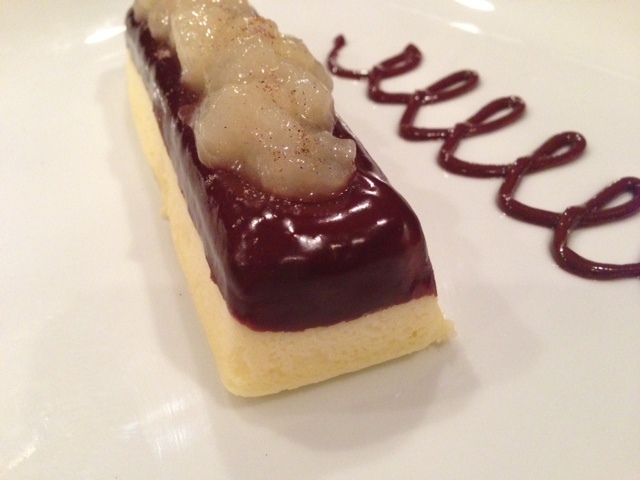 Having seen eclairs, profiteroles at every corner of cooking magazines and facebook profiles, I could not help but making my own the night prior to Mother’s Day. So at 10 o’clock in the evening, this is what I was doing in my kitchen. In a saucepan, heat up the milk, water, salt, and sugar. Add the butter cut up in pieces. When the butter has completely melted, bring the mixture to boil. Remove the pan from the stove and add the flour by stirring very well. Place the pan back on the stove ( it must be turned off, but will still be warm), and stir and stir with a heat-resistant spatula until the dough starts becoming a ball and will no longer stick to the rims of the pan. Remove the pan from the stove, empty the dough into a cold bowl and add the eggs to the dough one at a time, mixing well after each egg. 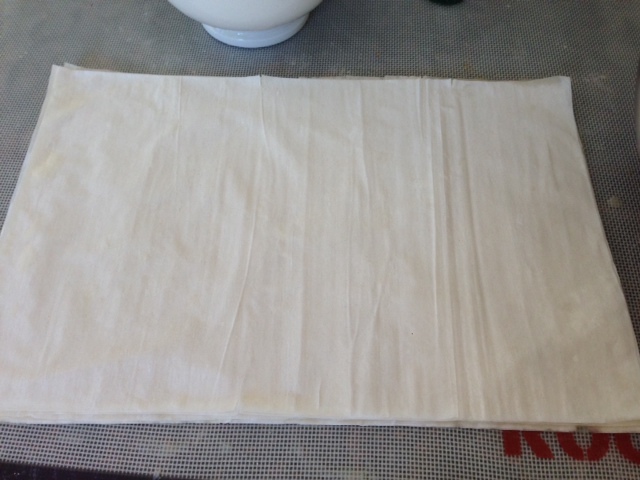 Place the dough in a pastry bag, with the large circular tips make large rounds of about 1 1/2 inches wide on a large silpat that you would have previously lay on a large perforated sheet. 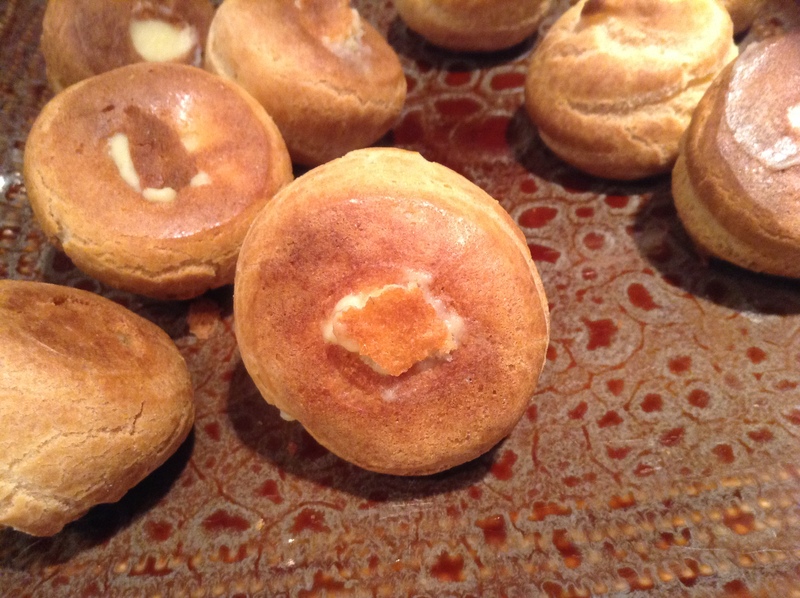 Place the perforated sheet in a warm oven of 350 and cook the cream puffs for 20 minutes. The dough should be brown and dry on all sides. If the dough is a little bit soft, continue cooking the puffs for 1-3 more minutes. Take them out to cool. Set them aside to prepare the pastry cream or creme patissiere. 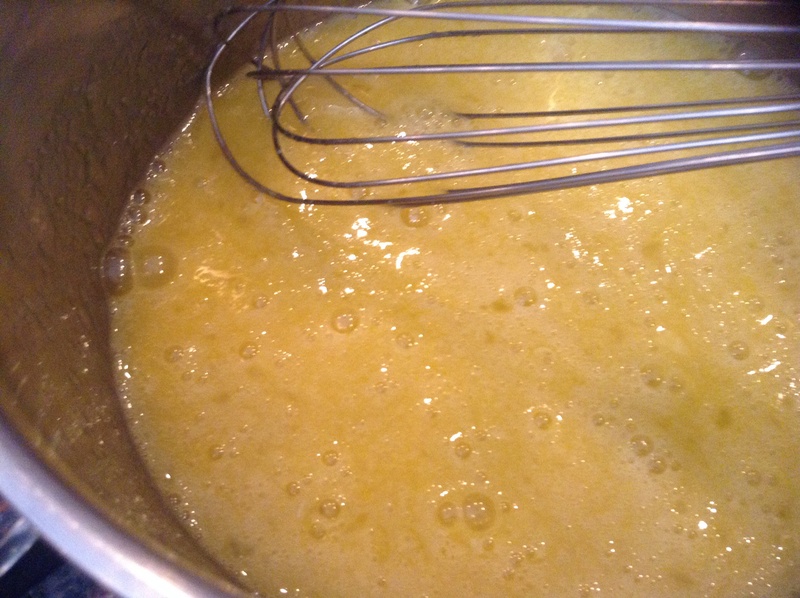 In large bowl, beat the egg yolks with the sugar until the mixture becomes whitish. Add the flour and the corn starch to the eggs and mix. Open the vanilla bean, scrape the seeds out of the bean and put them into the milk. Warm up the milk over the stove, or in the microwave for 2 minutes. Pour the hot milk into the egg mixture and stir. 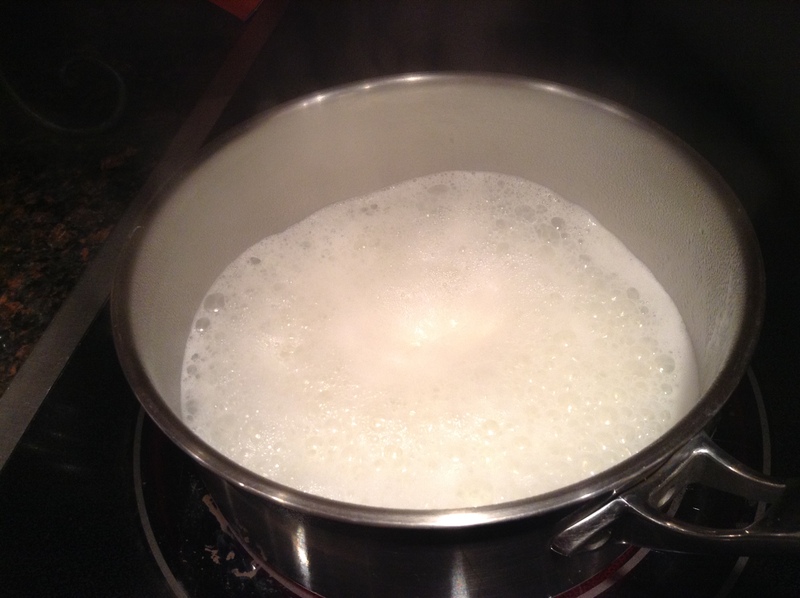 Place the milk/ egg mixture back onto the stove and cook until the mixture is bubbling and is becoming really thick. Remove the pastry cream from the stove, and place it into a bowl. Set aside. Pour the pastry cream in a round mold..
Cover the pastry cream with some plastic wrap and place it into the fridge to cool. 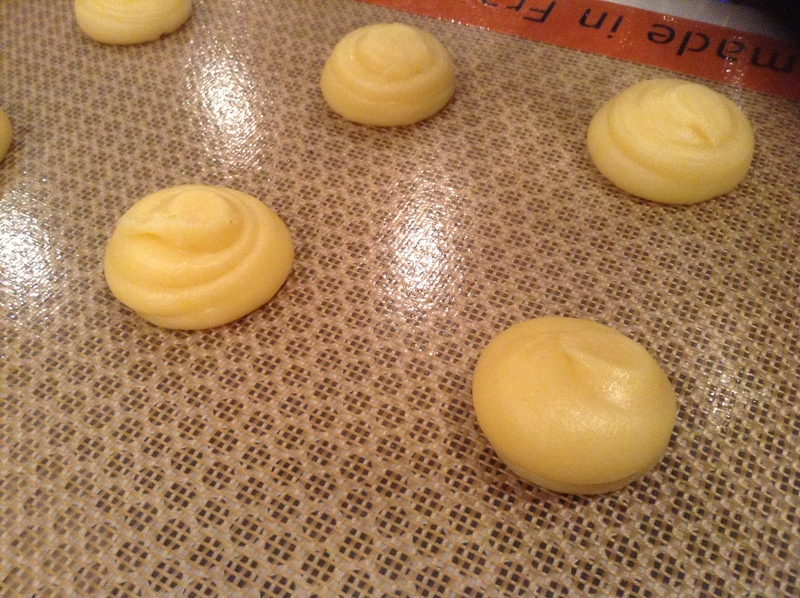 When the cream is completely cool, make a small indentation to fill the cream puffs with the pastry cream and lay them upside down for easier access when you are going to fill them up. 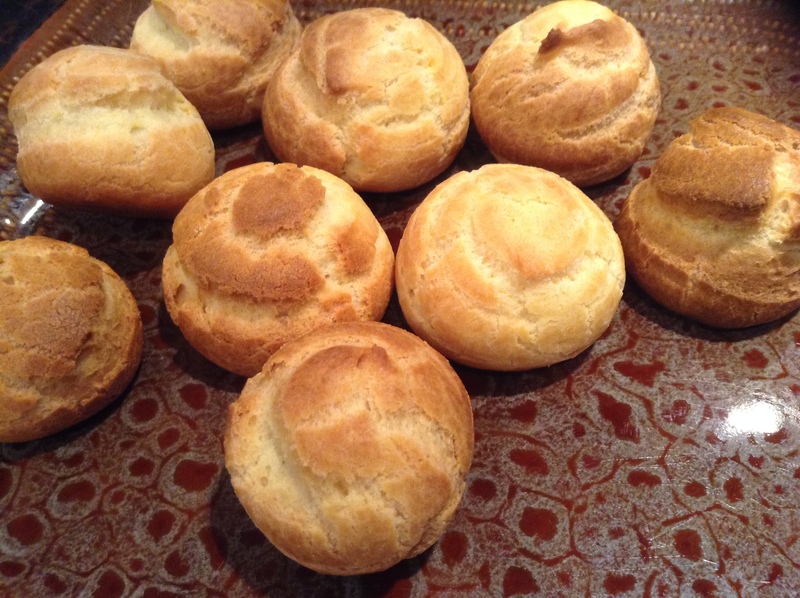 Fill the pastry bag with the vanilla cream and fill each cream puffs. 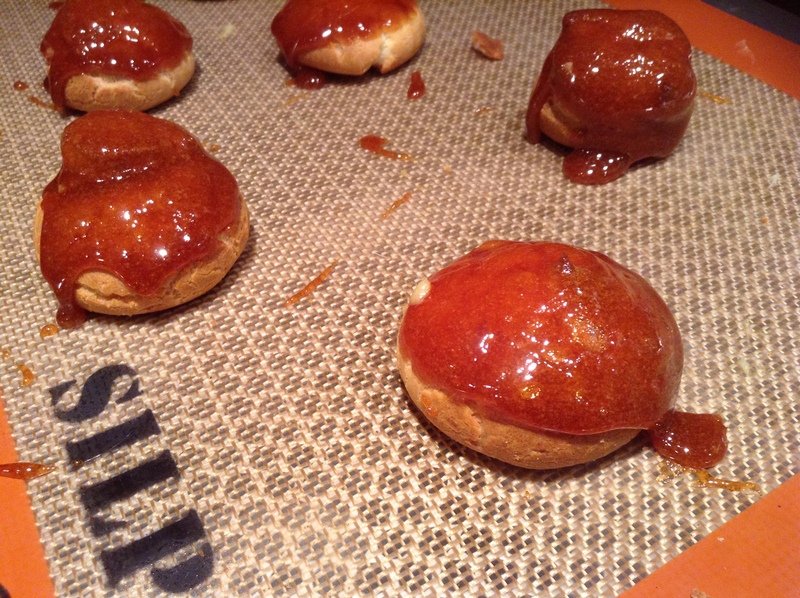 Place the puffs back onto the silpat, and prepare the caramel. Empty the cup of sugar into a medium-sized saucepan and place the saucepan onto the stove at a medium high temperature. DO NOT STIR!!! 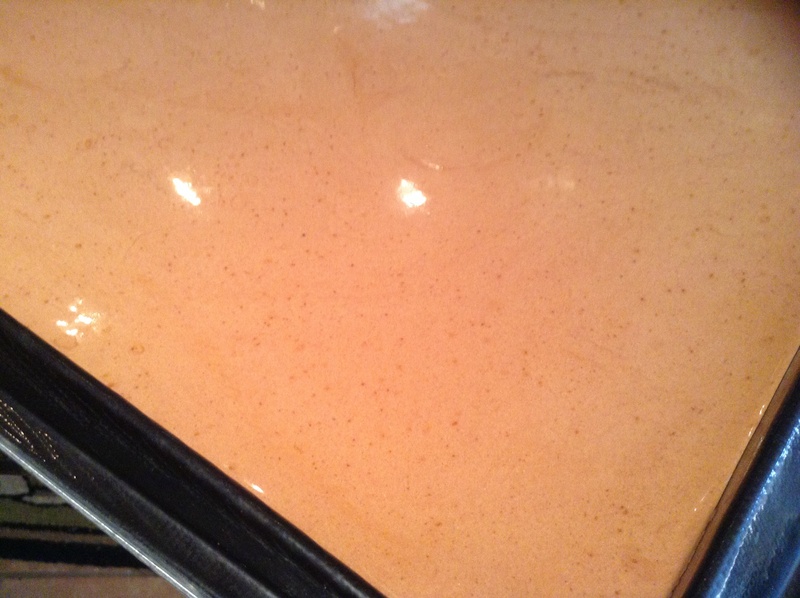 Only start stirring once the sugar is turning an amber color on the outside rim of the saucepan. Stir until all the sugar has turned that amber color. Reduce the heat to low, and leave the pan on it so that the caramel will not harden. 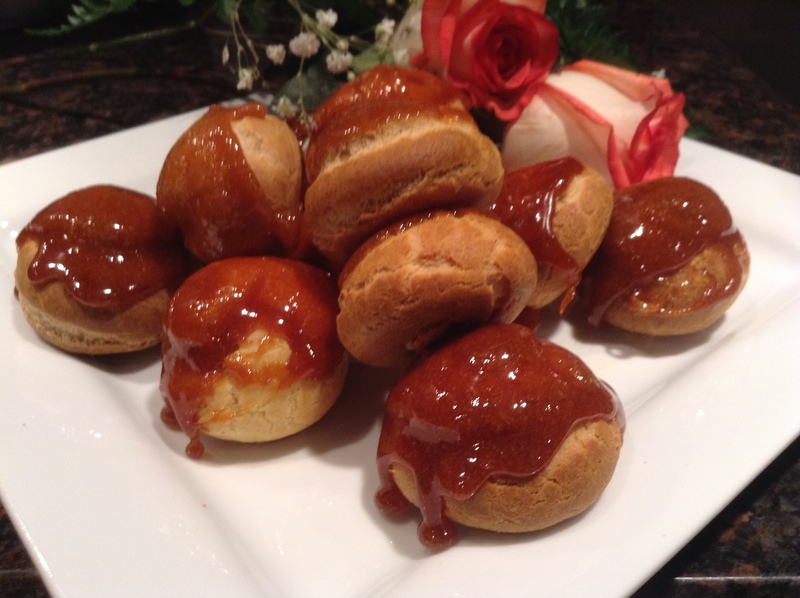 Dip the head of each cream puff into the caramel and place them back onto the silpat until the caramel has hardened, and has cooled. Eat when they are cool. I dare you to only eat one, or two. They are so good, you will want to eat them all at once!!! Bon Appetit and Happy Cooking!!! I should have posted this dessert months ago, but time has been so scarce that it is seeing only the light of the day today. I know many of you have asked to get this recipe, so here it is;-) A Vos fourneaux mes chers amis!!! On birthdays, we are expected to invite the whole family over to celebrate the event. I never understood why, but I have gone along this tradition ever since I have been married to my husband. So since I am to cook, and since we are celebrating someone special, i always always ask what my husband, son, or daughter wish to eat on their special day. 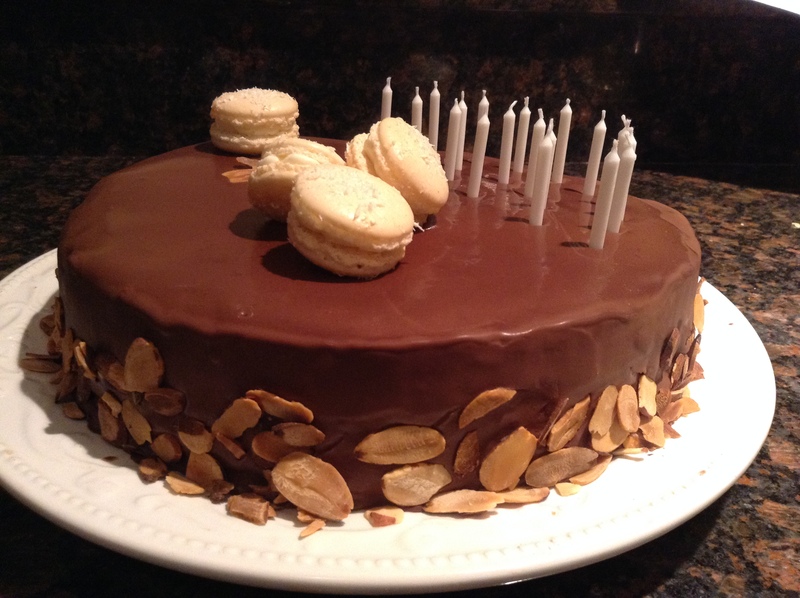 When my oldest child Lisa turned 18 this year, she requested the following : Beef Wellington, Macaroni and Cheese Appetizers, a chocolate dessert and anything in between. I figured the rest out making sure it would please her. I think we had macaroni and cheese appetizers bites, mini crab cakes, truffle flavored potatoes, green beans and a very very yummy dessert. 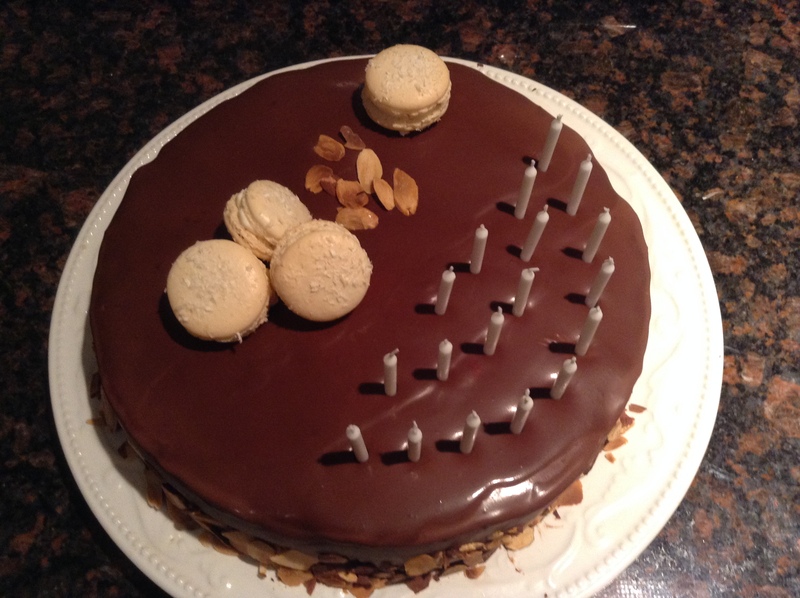 She loves chocolate mousse and love decadent desserts like me so i thought i would bake a cake out of the wonderful book of Stephane Glacier called Le Marceau from hi s beautiful bool called Tartes, Gouters, and Entremets. I adapted his recipe since it was designed to make 4 cakes, and not everything turns out the same with American ingredients and ovens. 175 gr. of pralin ( recipe here). 125 gr. of feuillantine ( very thin waffer from France, if you do not have any, you may replace with cigarette russes ( it will not be as good, but it will work). 300 gr. of dark chocolate chips such as bittersweet Ghiradhelli. First we want to prepare the cake so that it will completely cold when we will assemble to cake. Beat the egg whites with 12 gr. of sugar until they are forming hard peaks. Set aside. Place the egg yolks in a kitchen mixer and beat the egg yolks with 50 gr. of sugar until they are foamy and have doubled in volume. Set aside. 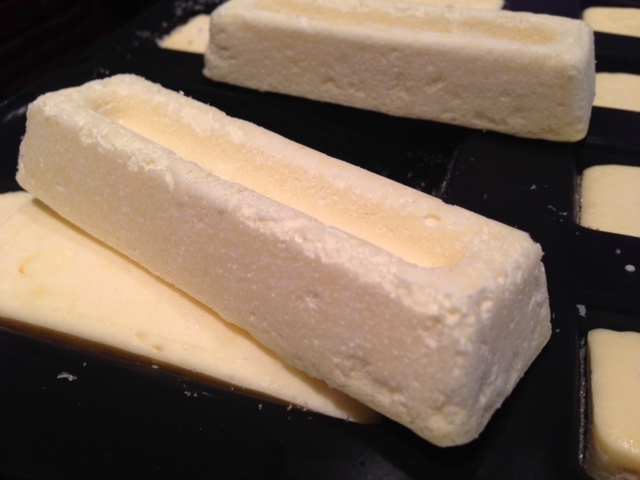 Place the butter in a small bowl and microwave for 30 seconds or until it is completely melted. Set aside. Add 1/3 of the egg whites into the egg yolk mixture carefully so as not to deflate the egg whites. Mix the flour, cocoa and add it to the egg white/ egg yolk mixture. Add the rest of the egg whites to it. Slowly mix in the melted butter. Pour the batter into a medium round that you would have placed on a medium perforated sheet, and cook in a warm oven of 320 for 20-25 minutes (or until the tooth pick comes out clean). When the cake is cool. Unmold it from the round mold. Slice it in half and set it aside. Let’s do the syrup as well since it needs to cool: place 100 gr of sugar, 125 gr of water, and 1 tbsp of vanilla extract into a small saucepan and bring to boil. When it has, turn the heat off and set it aside to cool. Let’s prepare the Praline Crunch: Place the chocolate into a small bowl and microwave it for 60-90 seconds or until it is melted and fluid. Pour this chocolate into a kitchen mixer. Add the pralin, the hazelnut oil and the feuillantine and pulse a few seconds so as to make a paste like texture. 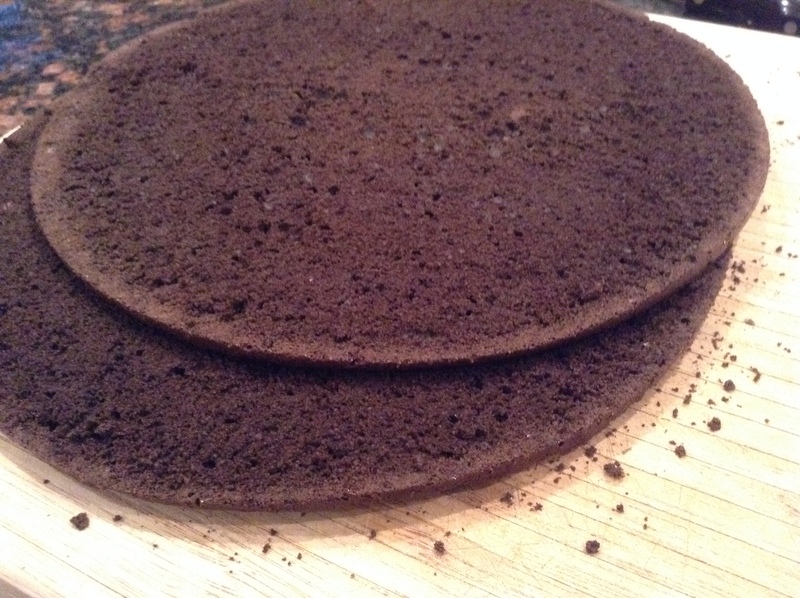 Place the metal round onto a medium silpat that you would have placed on a perforated sheet. Pour the praline croustillant inside the metal round and spread it out evenly. Place it in the fridge to cure. Prepare the mousse: in a small saucepan place the water and 100 gr of sugar and cook over high temperature. Cook until you are starting to see large bubbles or your thermometer is showing 118c. 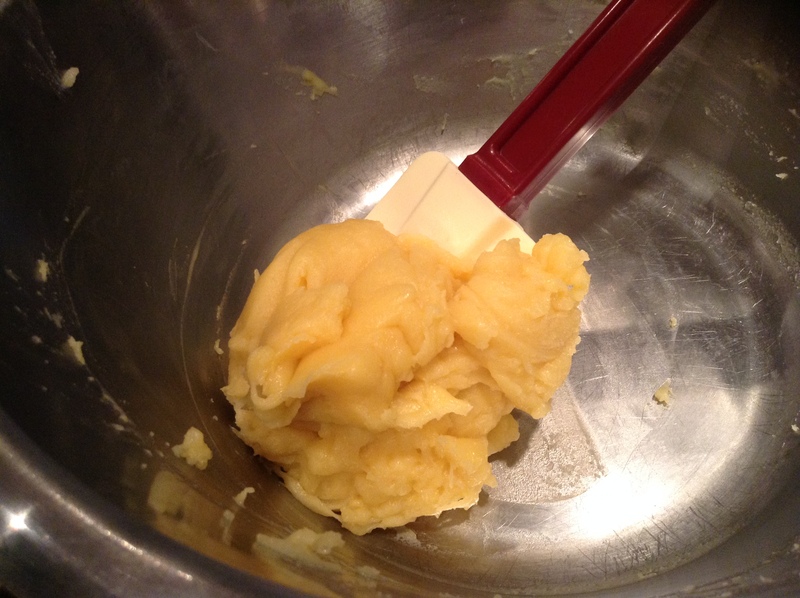 Mix the egg yolks, and eggs into a kitchen mixer until they are becoming foamy. Slowly pour the syrup while you are still beating the eggs. And beat on high until the mixture has cooled down completely. Meanwhile place the chocolate into a medium sized bowl and cook for 90 seconds to 2 minutes until it is melted and free if lumps. You may need to add 30 more seconds to get to the right consistency. Set aside. 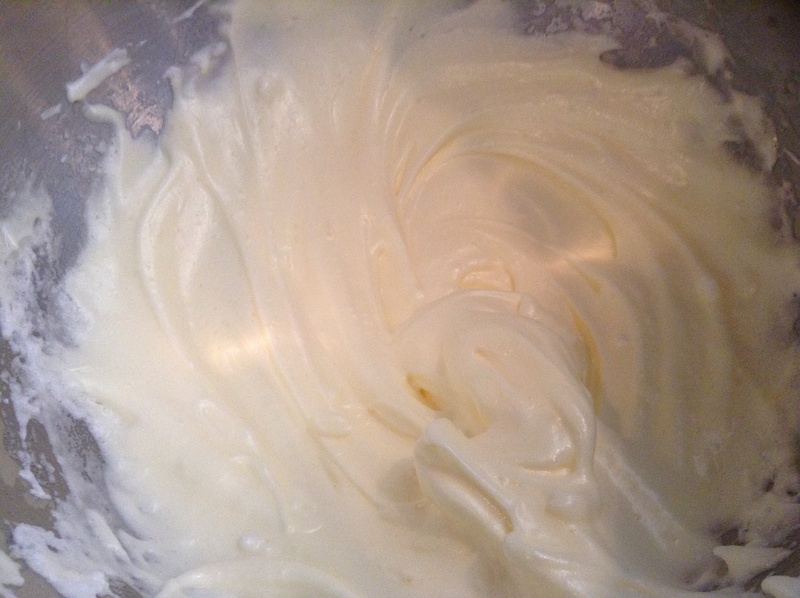 In another kitchen mixer, beat the cream into a soft peak whipped cream. With a spatula carefully fold in the whipped cream into the chocolate. Whisk the mixture to get an even mixture. 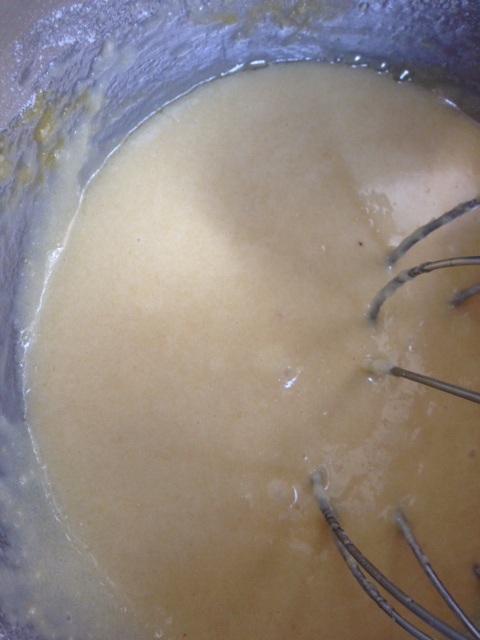 Add the egg mixture and mix well until the mixture is homogeneous. Yeah, now it is time to assemble the cake!! With a spatula, spread a bit of the mousse atop of the pralin layer. Pour the syrup into a rectangular cookie sheet and soak up the cake with that syrup. You will need to either turn the cake, or pour some on top of the cake to make sure that the cake is throughly soaked with that syrup. Place one cake on top of the mousse. 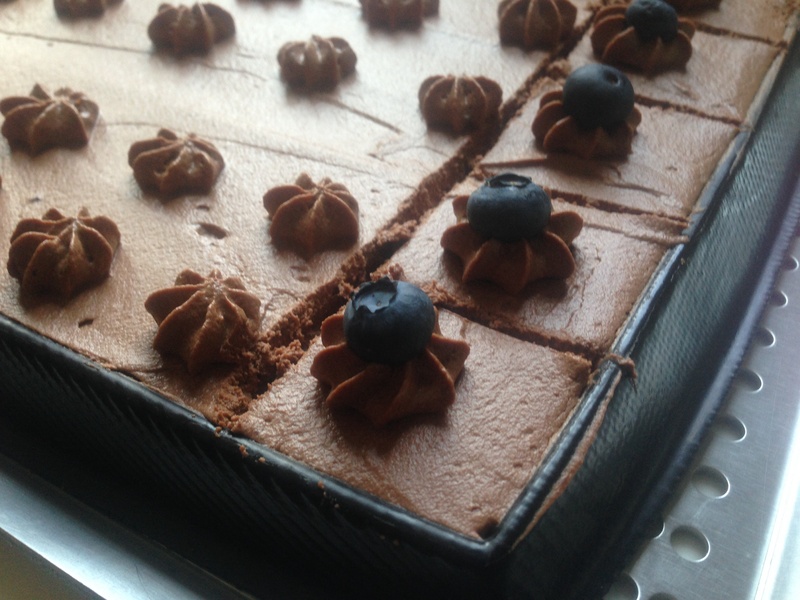 Press hard so as to glue the cake to the mousse. 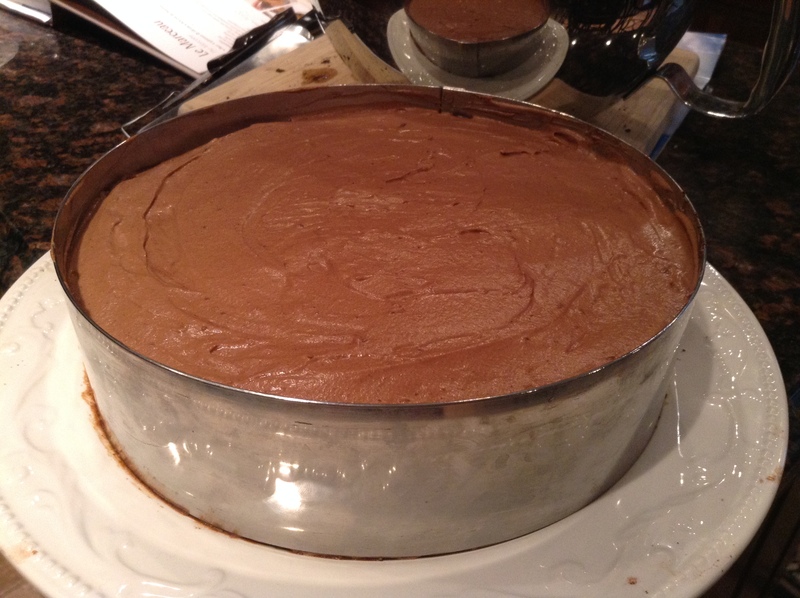 Top the cake with 1/2 of the mousse. Place the other half of the cake. Cover the cake with the remainder of the mousse. Place the cake in the freezer to set at least one hour. Meanwhile prepare the chocolate glaze. In a microwavable container, pour in the cream, syrup, and the glucose and cook for 1 minute in the microwave or until it is hot. 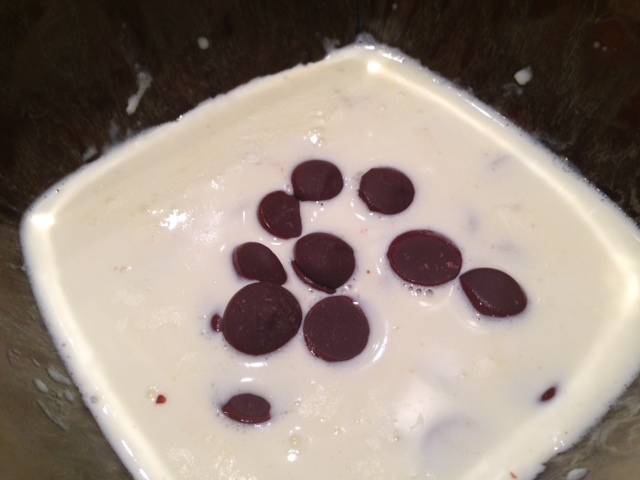 Pour the mixture over the chocolate chips that you would have placed into a bowl. Let the mixture sit for a while to let the chocolate chips melt on their own. After 1-2 minutes, start stirring. Let the mixture cool a bit before glazing the cake. Place the cake onto a cooling rack, and pour the ganache over the cake. 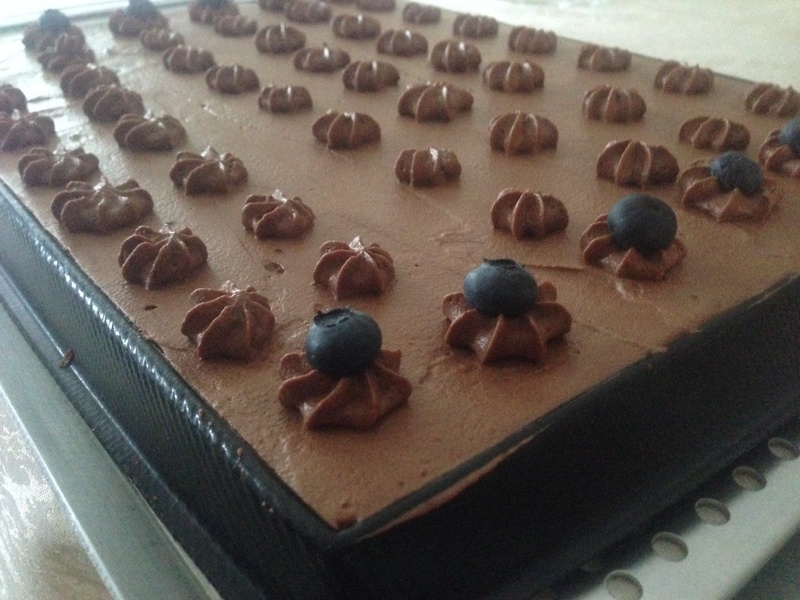 Collect the ganache that dripped down and pour it over the cake again. 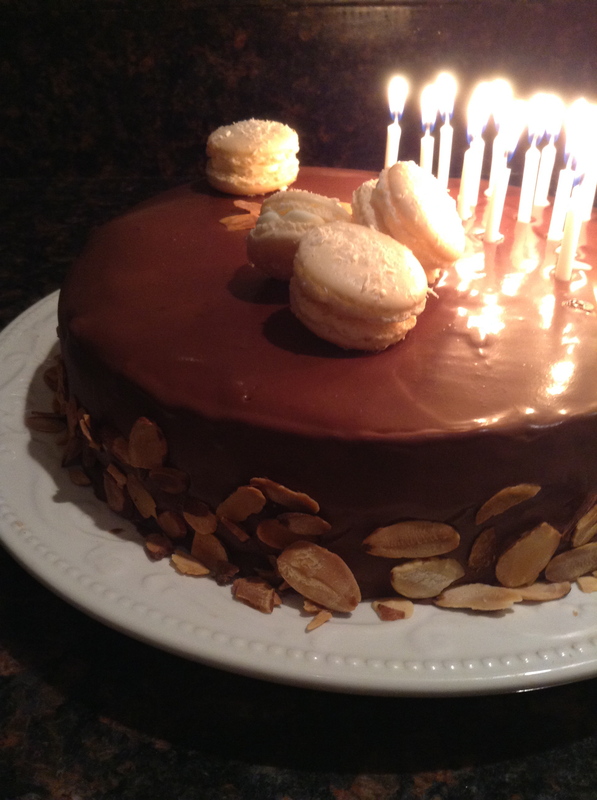 Be careful to only use “clean ganache” without cake debris so that the cake will look shiny and even. Place the cake into the fridge to cool. Et voila!!! Miam , miam. Definitely one of the best cake I have ever made!!! Merci Stephane!!! Though my mother-in-law asked that i not bring anything, I did not listen.. you know me:-) I will take any opportunity to play in my kitchen. This cake looks very fancy, but is not at all so I hope that you will give it a try, and impress your friends and family. This recipe was adapted from a recipe from Guy Demarle called “Bouchees Tropicales”. Ingredients for 15 individual portions, or 56 miniature, bite size desserts. Ingredients for the Chocolate Cake. Fresh fruit for decoration, I used blueberries. This cake is really easy to make, but requires a bit of time as they are 4 steps to it: the cake, the raspberry mousse, the chocolate mousse and finally the decoration. Place the chocolate chips for the chocolate cake into a small container and melt it into the microwave for 60 seconds. Add the butter and mix it in. Set it aside. Meanwhile divide the eggs into yolks and egg whites. 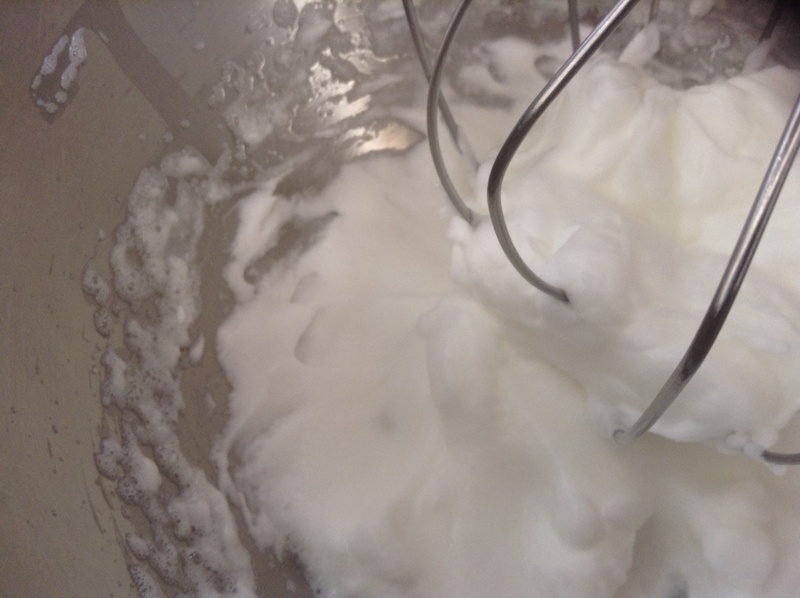 Place the egg whites into a kitchen mixer and beat them until they are foamy. Add the sugar and continue beating the egg whites until they are firm. Add the egg yolks into the beaten egg whites and beat them for a few seconds. 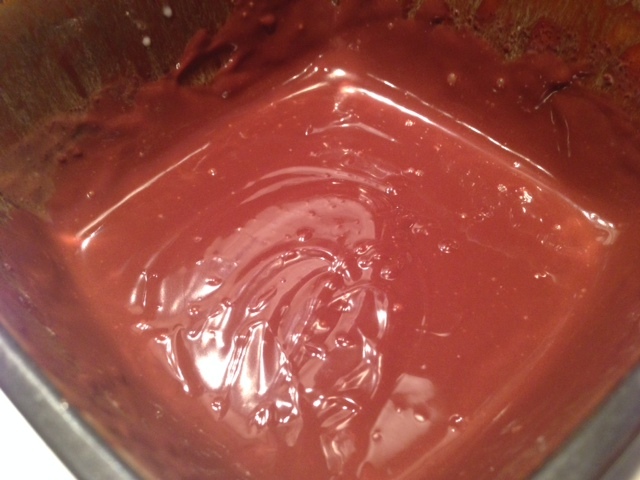 Slowly mix in the egg white mixture into the chocolate mixture and mix it until the cake batter is smooth. Spread this cake batter over a deep flexipan and cook it for 8 minutes. When the cake is cooked, set it aside to let it cool and prepare the raspberry mousse. Empty the gelatin into a small container and pour a tbsp of water over it. Let the gelatin soak and set it aside for a few minutes. Meanwhile, pour the content of the jelly into a small saucepan and warm it up over medium temperature. While the jelly is warming up, beat the eggs with the sugar just enough so that the sugar is no longer visible. Add the cornstarch and mix well. Pour a few tablespoons of the jelly into the egg mixture and mix well. Empty the gelatin into the jelly and cook for a few minutes. Add the butter and mix well. Add the jelly mixture to the egg mixture. Mix well and cook over low medium heat until the mixture is boiling. Pour this mixture over the cake. Shake the pan against your countertop so that the raspberry mixture will spread out evenly and be smooth. Place the tray into the freezer for a minimum of one hour. 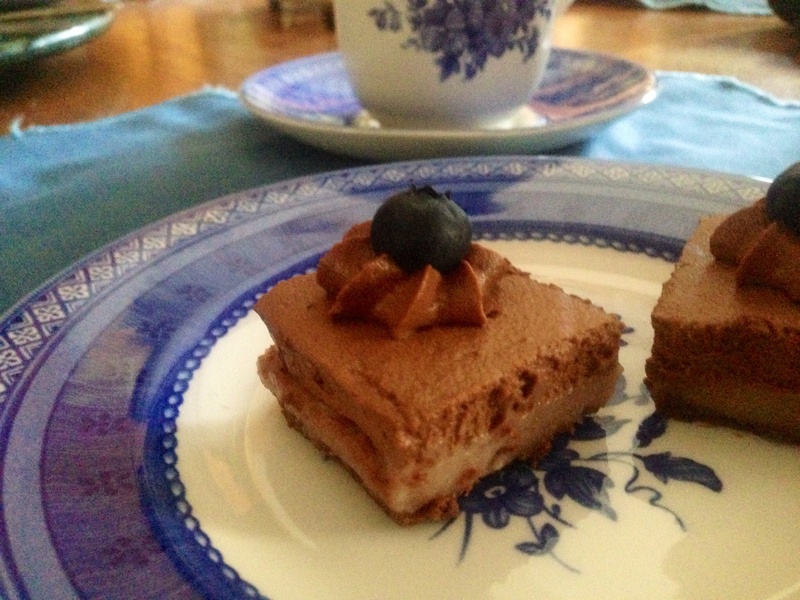 To prepare the last layer, you will need all the ingredients for the chocolate mousse. Place the chocolate chips into a bowl and microwave it for 2 minutes. Stir. And cook for another 30 seconds if needed, continue cooking until the chocolate is completely melted and is free of lumps. 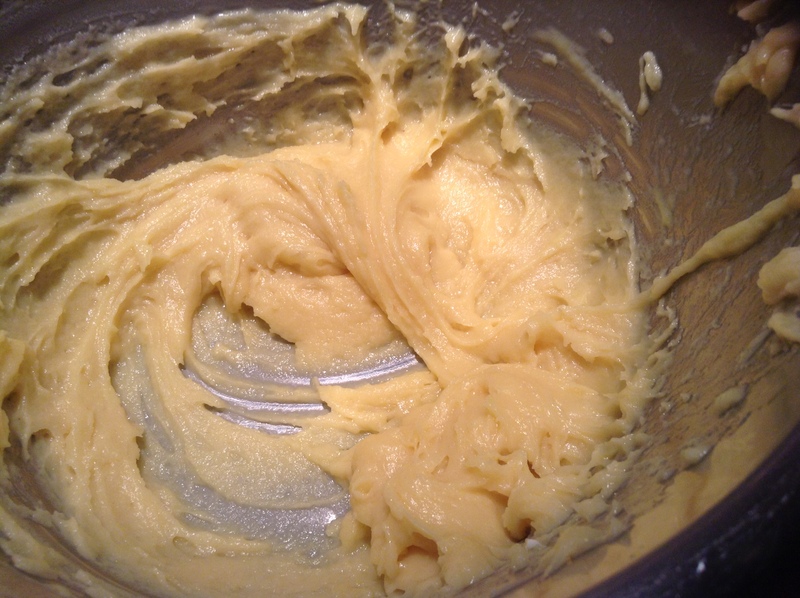 Meanwhile place the cream into a large mixer and whip the cream until it is thicker but has still soft peaks. Add 1/4 of the whipped cream into the melted chocolate and mix well. Then add the rest and slowly mix well until the mixture is a smooth texture. 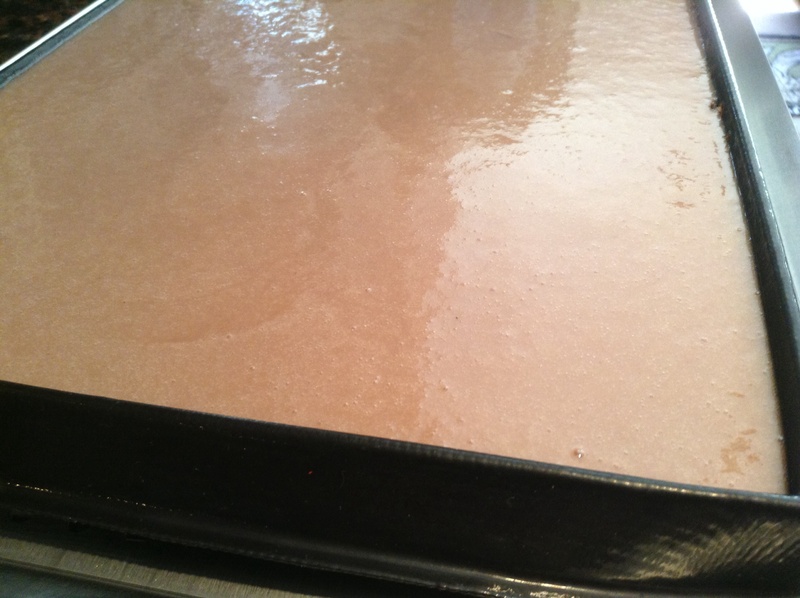 Spread the chocolate mousse over the raspberry mousse and place the tray back into the freezer for another hour. 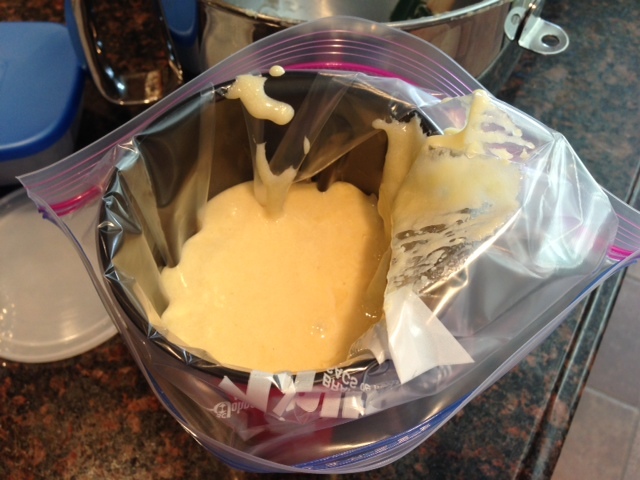 Keep the remainder of the mousse into a piping bag and place it into the fridge for later use. You will need it to decorate the cake before serving it. 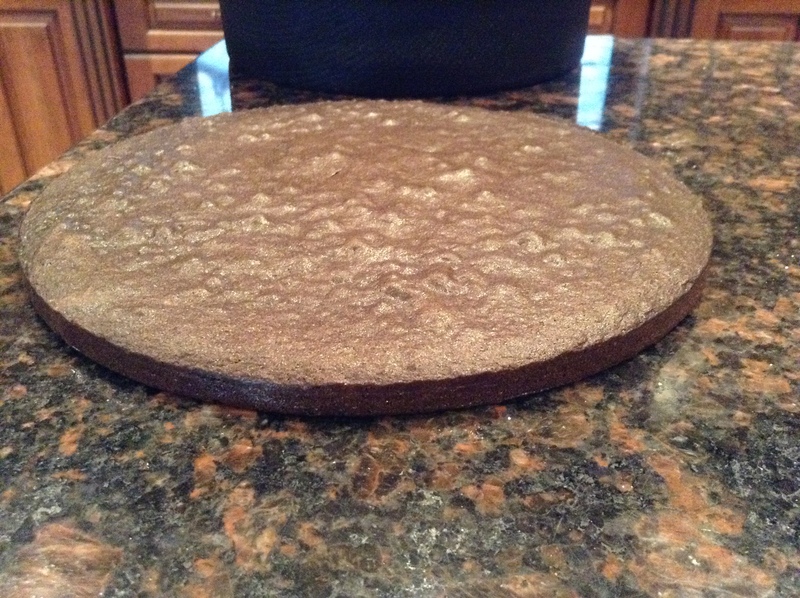 Let the cake warm up at room temperature for 15 minutes to 30 minutes before eating it. It will be very soft and will melt in your mouth;-) Yum Yum!! One of my dad’s favorite was Poire Belle-Helene, or Pear Belle Helene. 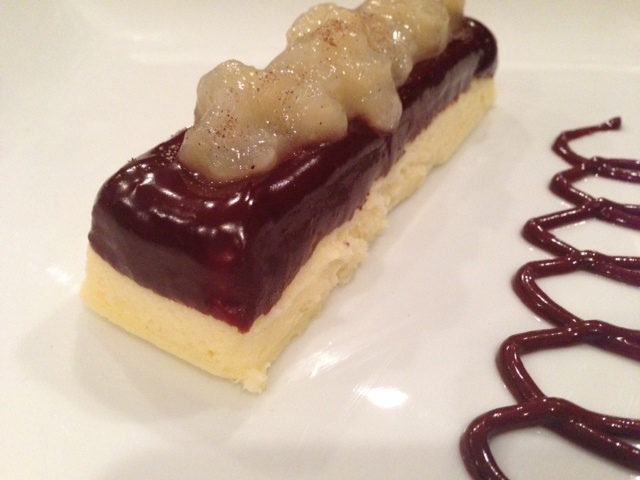 It is a dessert made of Poached Pears atop vanilla ice-cream, and covered with Chocolate Syrup and toasted almond. It is delicious and really easy to do. According to Wikepedia, “Poire belle Hélène was created around 1864 by Auguste Escoffier and named after the operetta La belle Hélène by Jacques Offenbach.” The original Simpler versions replace poached pears with canned pears and crystallized violets with sliced almonds. 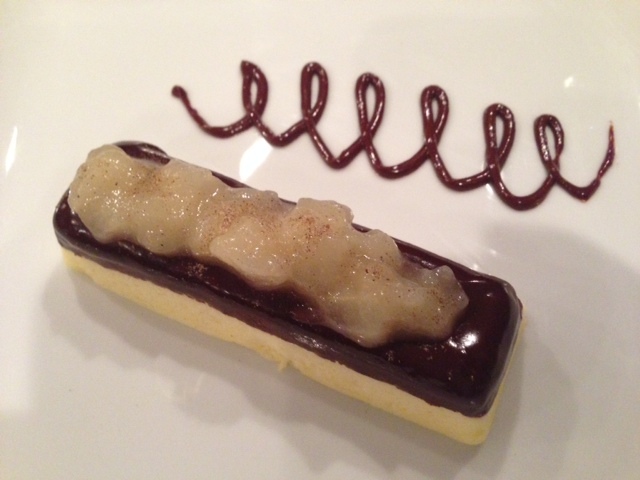 I love the combination of vanilla, chocolate and pear. 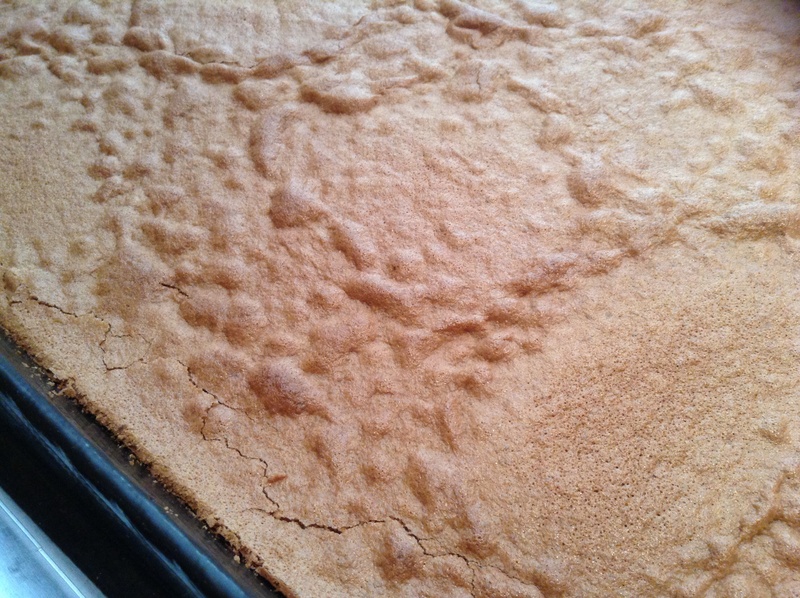 It is a comforting dessert, warm and delicious. This past Saturday I was in the mood for those combinations, but was also craving cheesecake instead of ice-cream so that is when I decided to combine all those ingredients to make this dessert. After coring and peeling the pears, slice them in half and cube them very small. 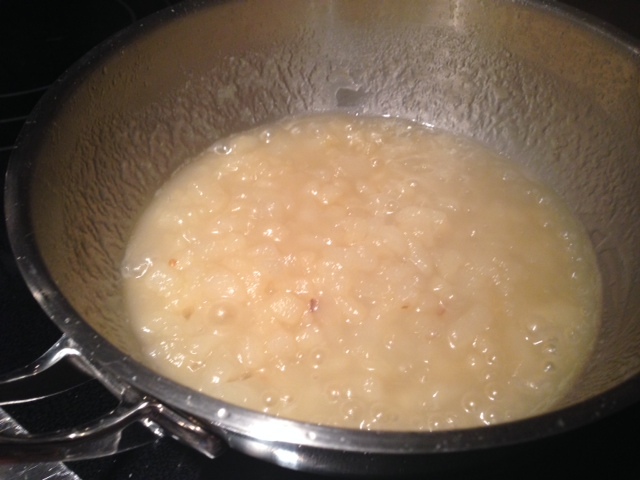 In a medium-sized saucepan, melt 2 tablespoons of butter and when the butter is sizzling, add the diced pears. Mix well. Add the sugar, the water and the tonka or cardamom spice. Bring to a boil and when it is boiling, reduce the heat down and cook until the liquid has reduced to half. When it is done, remove it from the heat and let it cook completely. 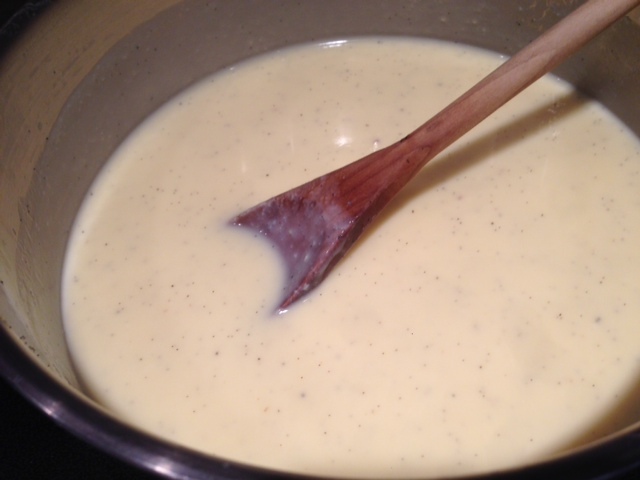 Place the heavy cream into a microwable safe bowl and cook the cream for 2 minutes or until it is really hot. ( you may cook the cream over the stove if you do not want to use the microwave). Place the chocolate chips into a small bowl. Pour the hot cream over it and let it sit for a few minutes. Place the cream cheese in a kitchen mixer and beat it. Add the sour cream and mix again. Add the sugar, egg yolks, eggs and beat it again until the texture is free of lumps. remove the vanilla seeds from the bean with a sharp knife and mix it with the heavy cream. Add the corn starch and beat until the mixture is smooth. Pour the mixture into a fleximold of your choice. I chose the lingot tray. Cook in the oven for 50 minutes at 194. 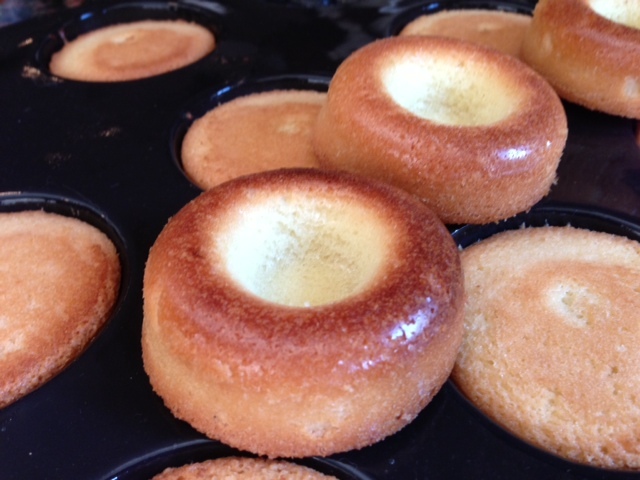 When the cheesecakes are cooked, let them cool and place them in the fridge to cool for a few hours ( overnight is better). 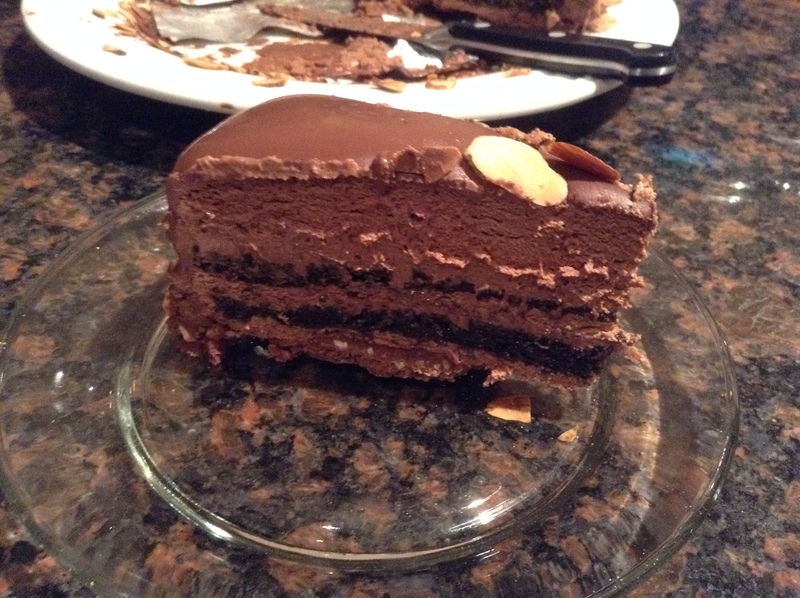 The following day, remove the cheesecake one at a time and dip them into the warm chocolate ganache to half. Place the cheesecake on individual plates. Place a few tablespoons of the pear compote on top of the cheesecake and drizzle of bit of the chocolate on the side of the cheesecake for added decoration. Et voila! 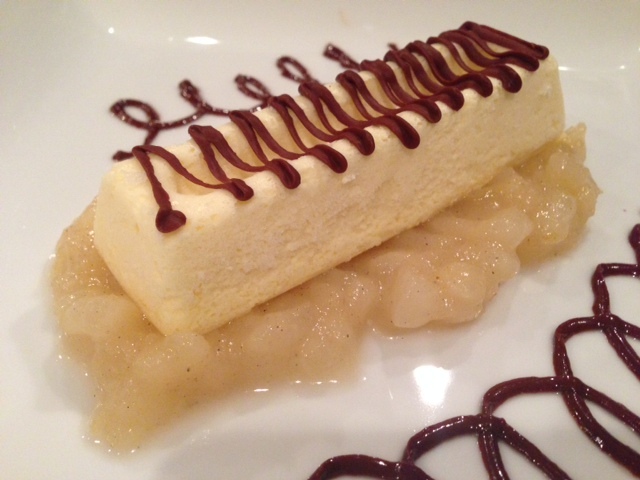 If you wish to serve more pear compote, spoon the pear compote on the plate, place the cheesecake on top of it, drizzle some chocolate over the cheesecake et voila! A few weeks ago, a good friend of mine contacted me to help her out with an event she was setting up for her son’s school. In order to broaden the knowledge of her child and his classmates, she had set up a series of international meals to be given to the students throughout the year. She had called a local restaurant to help her out with the German meal. Unfortunately she had forgotten to ask him to provide the dessert as well. Knowing that I am married to a German man, myself, she called me to see if I could help her out. Of course I did! A teacher at heart, I was not about deny her demand so I agreed to provide the desserts she asked. There are thousands of German desserts, but I thought that apple strudel would be very appropriate, and this is what i made. 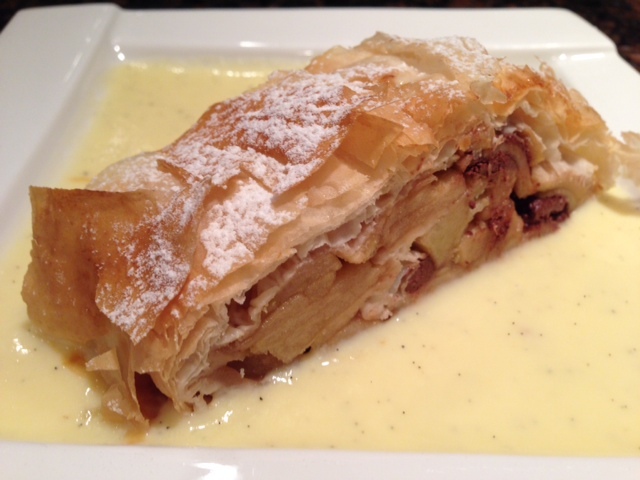 In a real traditional strudel the dough would be made from scratch, but not having the time on hand I decided to make the Apple Strudel the easy way, that is using filo dough. I hope that you will try to make it as well. It is easy, yummy and almost as good as a real one. Even my mother-in-law noted that it was very good. Peel the apples and slice them in thin slices. Place them into a large bowl. Mix in the brown sugar and the almond mill and mix well. Set aside. 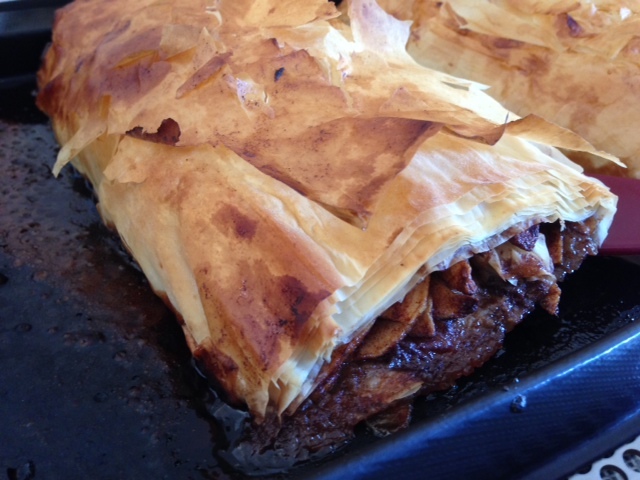 Roll out your roulpat, and place 2 phyllo leaves on it. Brush the layers with melted butter, or vegetable oil. Place 2 more leaves on top and brush with butter again. Repeat those steps until you have used at least 8 leaves. Empty the apple mixtures on the buttered layers and spread them out leaving a 2 inches border on the right side. 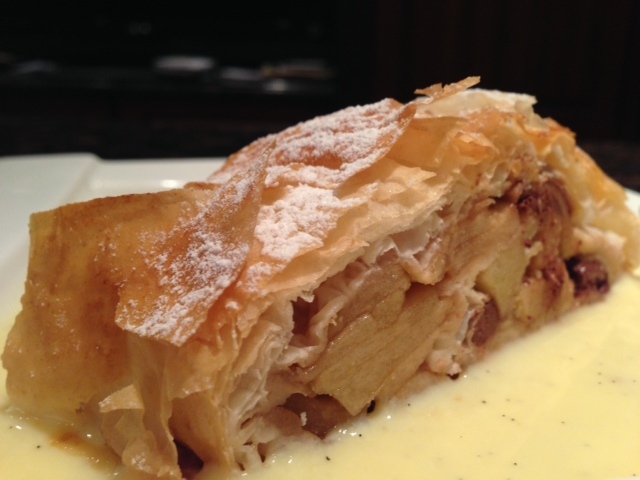 And start folding the apple strudel starting from left side and folding it to about 3 inches in above the apples. Continue folding until there is nothing to fold;-). Make sure the end piece is facing down. 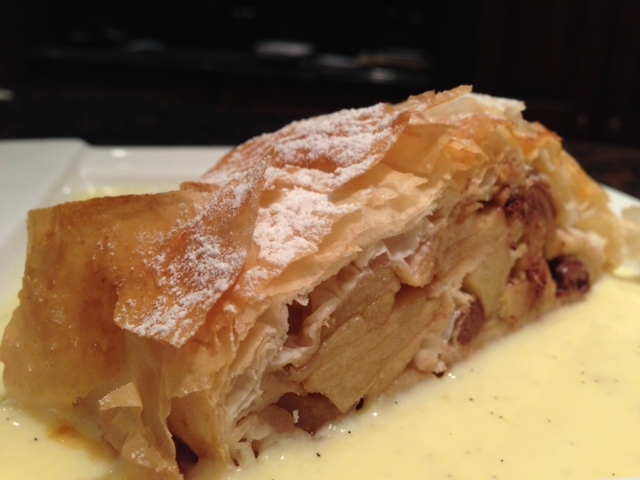 Carefully lift the apple strudel from the roulpat and plate it onto a deep flexipan that you would have previously placed on a medium perforated sheet. Brush the top of the strudel with butter and sprinkle with 2 tbsp sugar. Repeat the entire procedure for the second strudel. Bake the strudels at 400°F for 20 to 25 minutes, until browned. Cut the vanilla bean in half, scrape the vanilla seeds with a knife and place them into the milk. In a large saucepan, combine the half-and-half and vanilla bean and cook over moderately low heat just until small bubbles appear around the rim, about 5 minutes. In another medium bowl, whisk the sugar and egg yolks just until combined. Whisk in half of the hot half-and-half in a thin stream. Pour the mixture into the saucepan and cook over moderate heat, stirring constantly with a wooden spoon, until the sauce has thickened slightly, 4 to 5 minutes. Immediately strain the sauce into the bowl in the cold water bath to stop the cooking ( optional). Serve right away or refrigerate until chilled. Drizzle the creme anglaise in each individual plates. 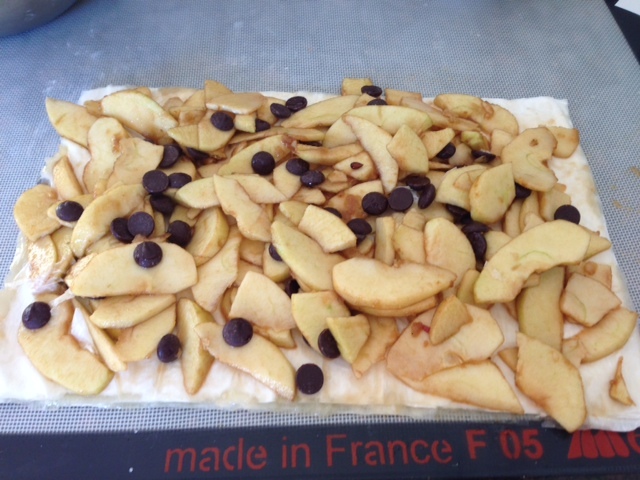 Cut the apple strudel in 1 inch thick, and place each piece on each plate. serving on individual plates. Sprinkle some powdered sugar with the sugar dispenser and enjoy! Two weeks ago I went to the Demarle Convention in Santa Ana. 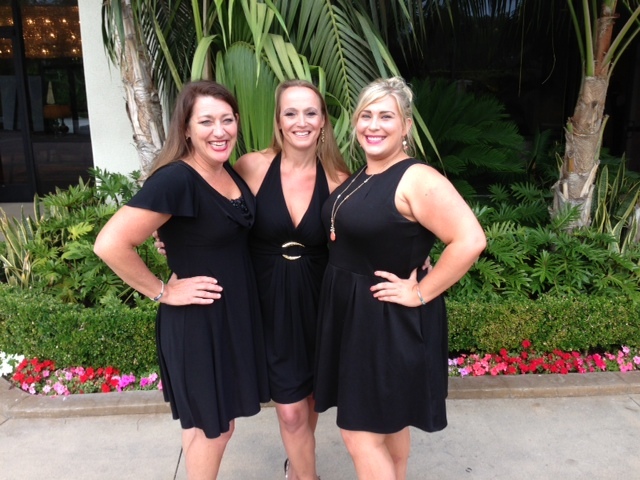 As a consultant for the company I always get energized by going to such event. 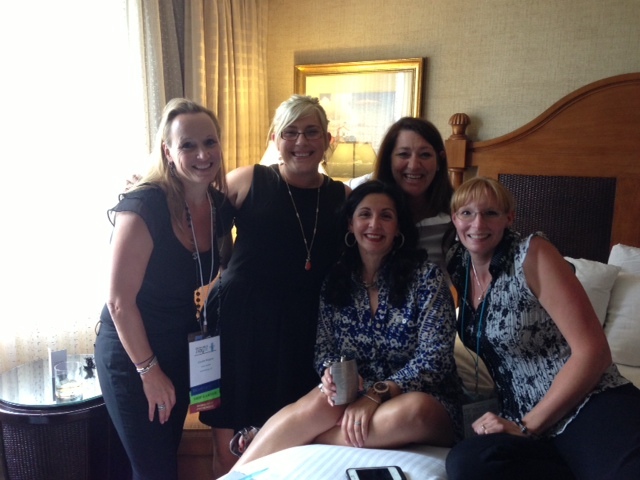 I connect with other consultant and we share tips and ideas on becoming more successful. 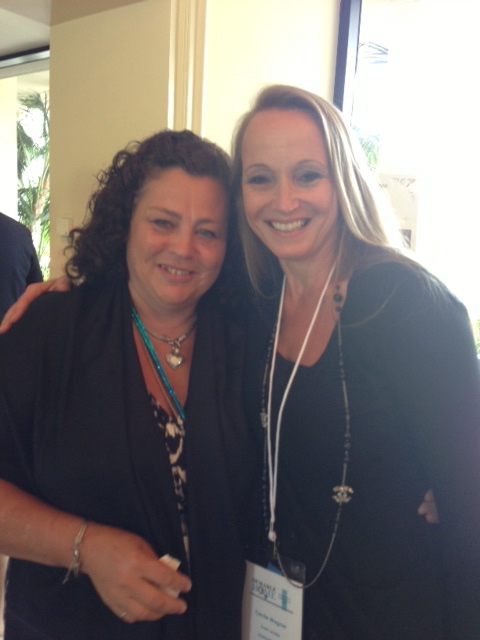 They are so many meetings, workshops and speakers that I always learn so so much. The event usually last 4 days. Even though it is meetings and workshops for 4 days, it is much fun because it is a bit of ” me time”;-), no husband to answer to, or children to take care of. Nice!!! 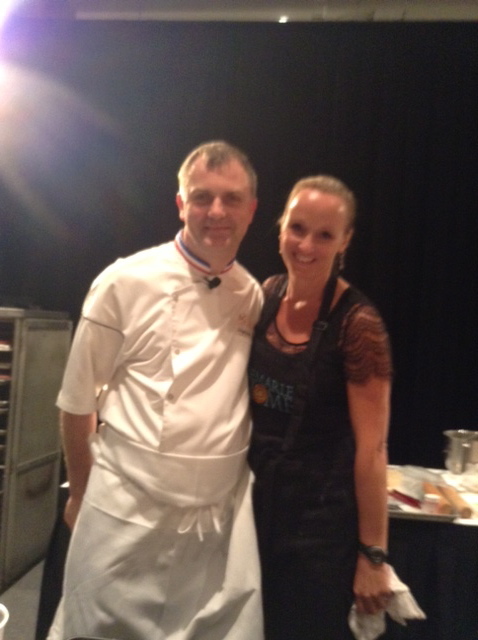 Four days in between girls would have been nice on itself, but to top it off the company hired a World Known Chef of the name of Stephane Glacier to do several cooking workshops during the event. What a treat! We learned so much!!! 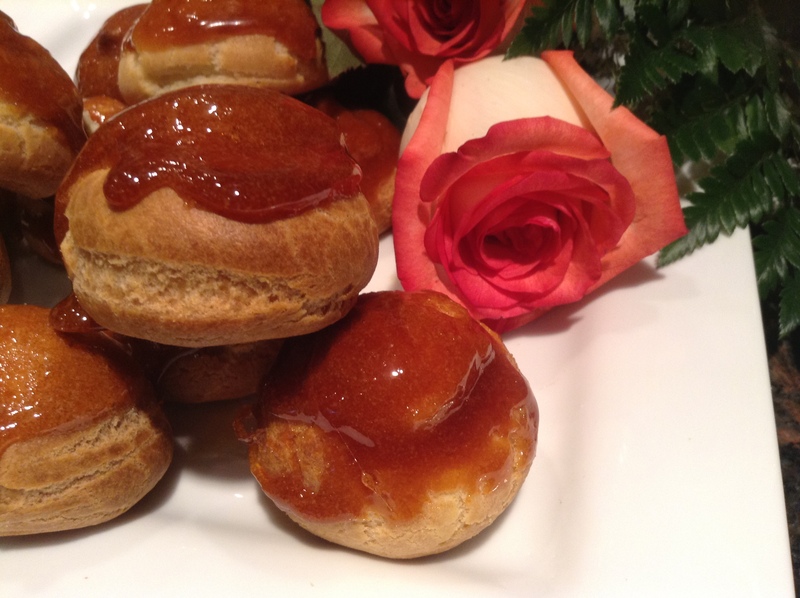 Today i would like to share with you one of the recipe he was so courteous to share. 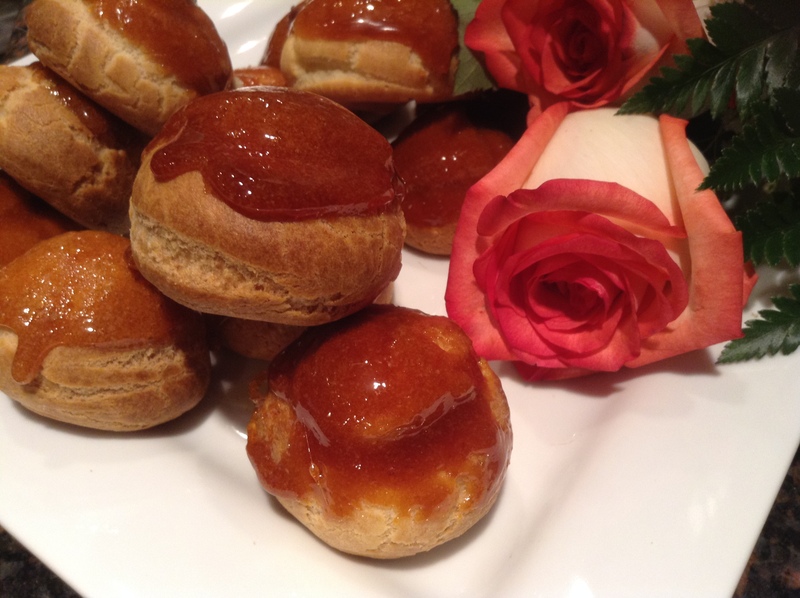 It is a quick recipe, very easy to make, to adapt and to dress up. In my eyes, a winner. In a regular-sized bowl, mix the almond and the sugar. Then add the eggs a bit at a time. Add the flour and the melted butter. Don’t over beat! Pour the content of the bowl into a large ziploc bag. Cut the corner of the bag with scissors and fill in the flexipan of your choice. I used the doughnut tray. Place a silpat flat to cover the flexipan. ( it will prevent the cake from rising too much). 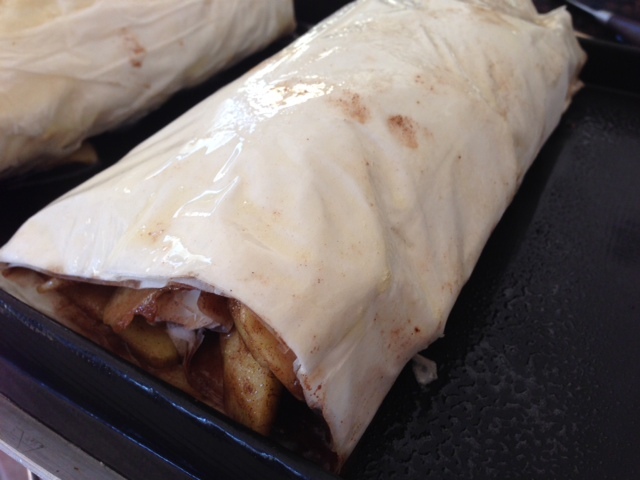 Place the flexipan onto a medium perforated sheet and cook in the oven for 10 minutes. Then turn the flexipan around to even out the baking and cook for another 10-12 minutes. 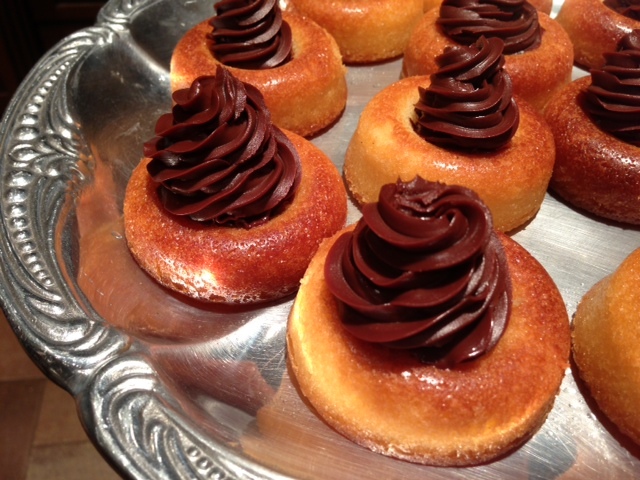 While the darlings are cooking, prepare the ganache and the syrup. 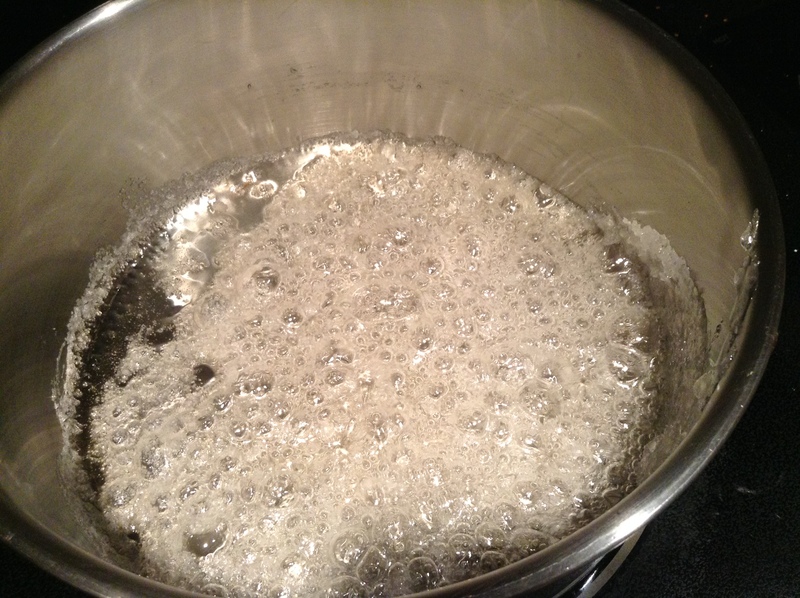 In a small saucepan, cook the water and the sugar until the sugar has dissolved. ( if you want to add a yummy orange flavor, add a tablespoon of the Blood orange olive oil in the syrup if you do not have orange extract).Set aside. Place the chocolate chips into a small bowl. Then microwave the cream and the honey for 1 minute and pour the hot cream over the chips. 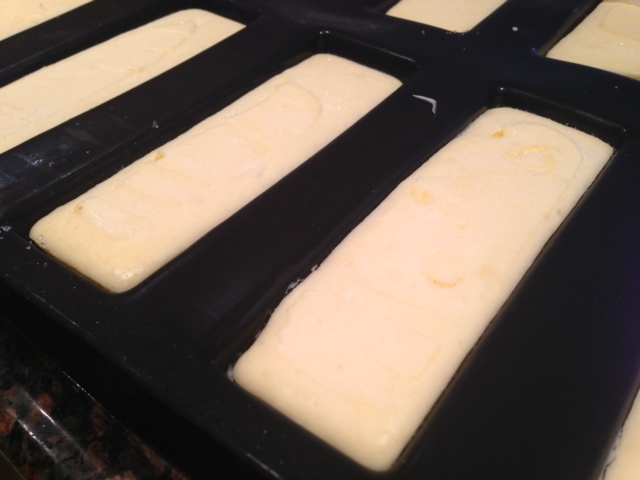 ( Add 1 tablespoon of orange flavored olive oil again in the ganache to flavor it).Let it sit a while. 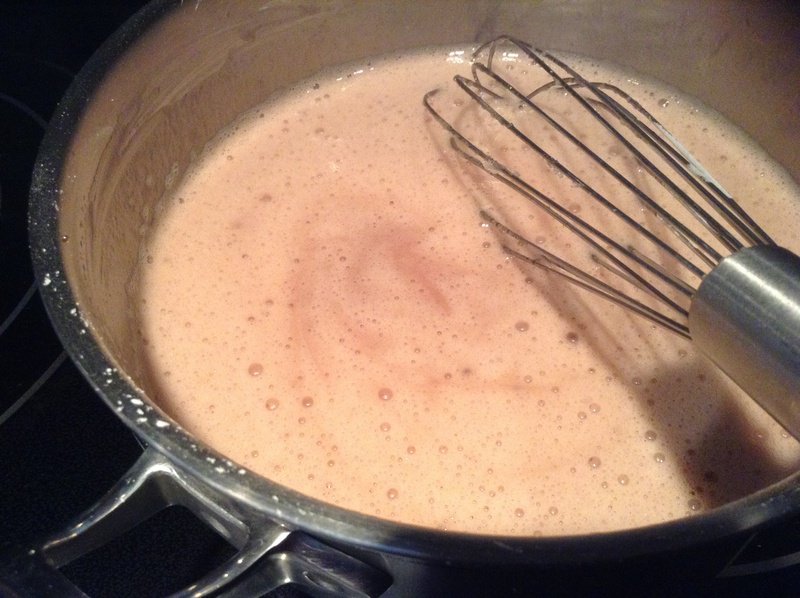 With a small whisk, mix the cream slowly to make the ganache. Add the soft butter and let the mixture cool at room temperature. 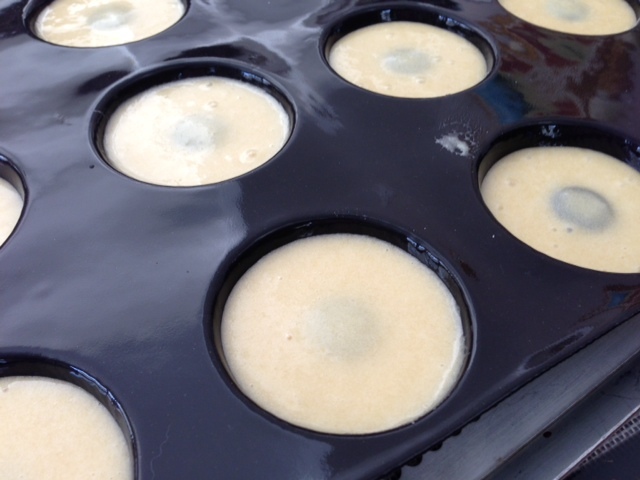 When baked, remove the flexipan from the oven and let it cool before removing the silpat and unmolding the cakes. 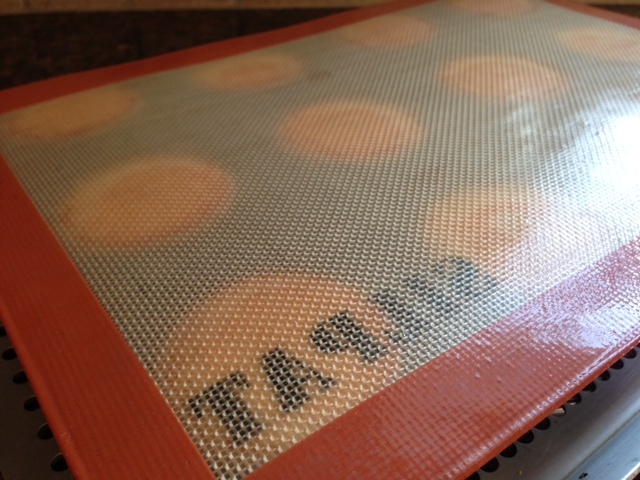 Dip the warm cakes into the syrup and place them onto a cooling rack to drain and cool.